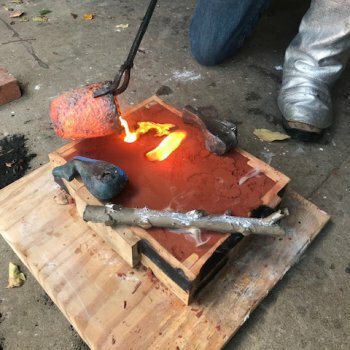 This two day program teaches the basics of bronze casting through making small basswood forms with minimal undercuts for sand casting. Techniques reviewed: pattern making, sand casting, pouring bronze, polishing, patina and finishing. All tools and sand materials provided. The bronze will be weighed and priced at the end of the class for each individual piece.